BERLIN - Dr. Thomas Brown says he simply grew up liking science. After graduating from Wesleyan University in Middletown with a bachelor’s degree in the field of study, he went to medical school in Dublin and received his doctorate from the West Virginia University School of Medicine. He completed his residency in internal medicine at Darmouth-Hitchock Medical Center in Hanover, N.H.
Brown then worked for a Doctors Express urgent care location in Danbury, working his way up to medical director. But when the franchise was bout by America Family Care, he noticed what he saw as a more corporate protocol for treating patients overcome the operation. That’s when he decide to break off and run his own urgent care center: Kathy’s Urgent Care. “It was a good decision,” said the 46-year-old Meriden native, husband and father of two, who now lives in West Hartford. 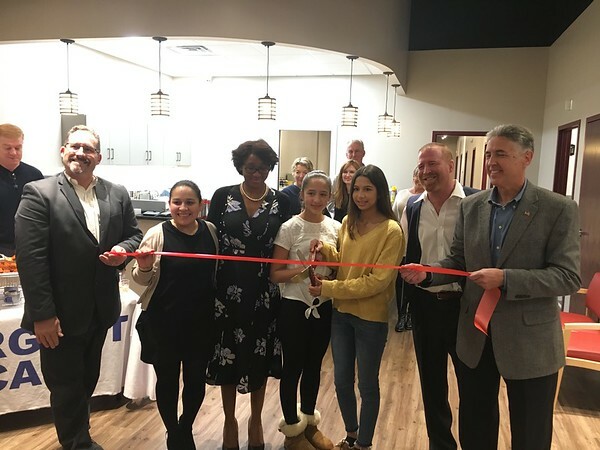 Brown recently celebrated a ribbon cutting for his third location, in Berlin, in August at 175 Webster Square Roard, next to Harbor Freight and Ocean State Job Lot. The first was opened just over three years ago in Wethersfield, with the second having opened in Rocky Hill. “Berlin’s been incredibly easy to work with,” said Brown at the ribbon cutting. He said meeting Economic Development Director Chris Edge and completing the more bureaucratic paperwork were a breeze. Edge first contacted Brown for a lunch meeting after hearing that Brown was looking to expand, Brown said. “I’m so excited that it’s here,” he added, while joking that he hopes he never has to pay a visit there. “They didn’t have an urgent care center,” said Brown, on why he chose Berlin. The substantial foot traffic was another reason he added. “It’s a nice fit,” he said. With Brown practicing internal medicine, he’s able to treat anything from diabetes to anxiety to broken and fractured bones, he said. The location has an X-ray machine, can have blood work done, help in sports medicine, provide physicals and more. Several types of insurance plans are accepted and payment plans can be set up for patients. “We try not to inconvenience and to be courteous of folks,” he said, while helping patients schedule appointments or referrals. Brown said two more locations are expected to open in West Hartford and Bloomfield. While urgent care centers are popping up and being acquired by larger health care operators, like Hartford Healthcare, because of the centers’ efficiency compared to emergency rooms and creation of in-network relationships, Brown said he isn’t planning on following that trend. While no one knows what may happen in about 10 years, he said, his “goal is to stay independent. The name of his center is an homage to his late mother, Kathy. Posted in New Britain Herald, Berlin, Business on Thursday, 22 November 2018 20:58. Updated: Thursday, 22 November 2018 21:00.